Discussion in 'General Suggestions' started by Scorch, Oct 14, 2018. When you get prop hunt ranks it will... because of course you will buy all of them like you try to do to smc. I haven't played prop hunt in a very long time and I've wanted to get back into it for a while now. 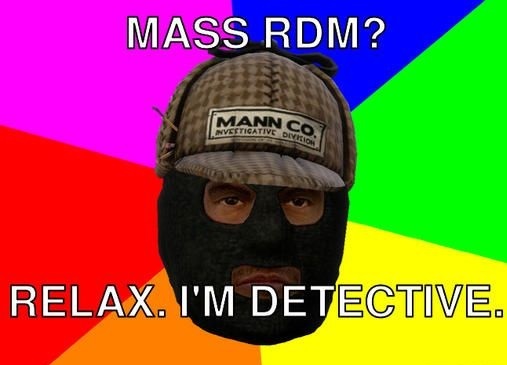 In the unlikely case SGM gets a prop hunt server I'd be more than willing to play on it. Prophunt will go the same way deathrun did. A big boom for the first month or couple months and then die off. There isn't much demand for these smaller gamemodes sadly. It has a better chance than DeathRun, DeathRun as it is right now, is rarely populated and all we would have to do is change the gamemode and name of the Deathrun server to Prophunt. It wont hurt trying, and Prophunt is something that still is a popular gamemode, something that is fun to play for several hours just like TTT, you dont get bored as easily as you do with Deathrun. How about a minigame server then? Instead of a mapvote at the end of the round, you get a gamemode vote where you choose if you want PropHunt, Deathrun, Extreme Football Throwdown(My favorite), and many more? Also multiple maps per gamemode which get picked randomly so we don't play simpson every time deathrun wins. While I can see the good in it, I can also see that it wont work out too well, it will devide the server population especially with how the rank system works. Im definitely up for Prop Hunt, I really love that gamemode, I'll never get bored of it! As long if it has Custom taunts! This is what I want to see. Every few rounds the gamemode changes up. It would be a lot of fun! I didn't say how the implementation would be done. Could be just the gamemode gets changed, or you get thrown into an entirely different server every few rounds. Spoiler: Click Here to Win a Prize! I mean not really at all. Just take the mapvote system and replace the icons and functions with gamemodes and maprestart with different gamemodes. I've done it easily before. Odd question but if we do have a prop hunt server, what sort of perks/status/awards should donors get?